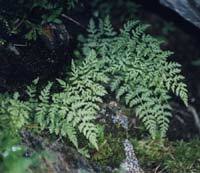 Young fronds. This plant has much finer segments. W Scotland (Main Argyll), early July W Scotland (Main Argyll), early July. Small plants can be confused with Woodsia alpina.